With great power comes great responsibility, so goes the famous saying. But responsibility is not all that seems to accompany puissance—dictators often exhibit extreme behavior, often in ways patently detrimental to their nations; managers are often accused of not understanding their subordinates’ points of view; and the dominant partner in a relationship often accused of being insensitive to the other’s needs. People in power, it seems, are prone to dismiss or, at the very least, misunderstand the viewpoints of those who lack authority. Research by Adam Galinsky (Professor of Management and Organizations at the Kellogg School of Management) and his co-authors Joe Magee (Assistant Professor of Management at New York University), M. Ena Inesi (Assistant Professor of Organizational Behavior at the London Business School), and Deborah H. Gruenfeld (Professor of Leadership and Organizational Behavior at Stanford University) explores the effect of power on perspective-taking and suggests that power reduces the ability to understand how others see, think, and feel. According to Galinsky, these findings may also give insights into how leadership can be harnessed to make global leaders more socially responsible. Galinsky and his co-researchers tested across five studies the hypothesis that—compared to individuals with little power—high-power individuals anchor too heavily on their own perspectives and demonstrate a diminished ability to correctly perceive others’ perspectives. The researchers first investigated the effect of power on one’s ability to adopt the visual perspective of another individual. 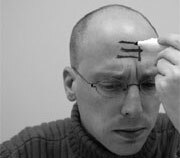 This was done by “priming” individuals with different levels of power, then asking them to write the letter “E” on their foreheads. To prime the subjects, Galinsky and his colleagues asked half the subjects to recall an experience when they had high power and the other half to recall a time of low power. 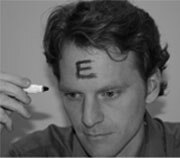 It was predicted that high-power individuals would be more likely to write the E in the direction in which they would read it (i.e., a “self-oriented” E [see Figure 1], which would appear to be backwards to a spectator looking at the subject’s forehead). Conversely, low-power individuals were expected to conform to an observer’s point of view, writing the E in the correct direction for reading by the spectator (“other-oriented” E [see Figure 2]), but reversed for the subject themselves. After accounting for effects such as participant gender and handedness, the researchers’ analysis confirmed that individuals primed with high power were three times more likely to draw a self-oriented E than those primed with low power. The next experiment was a study of the relationship between power and the extent to which power-holders assume others see and know the world as they do, often by believing others have access to their privileged and hidden knowledge. Again, the research participants were primed just like the first experiment. They were then asked to imagine that, with a colleague, they had an unpleasant experience at a restaurant that had been recommended by the colleague’s friend. The next day, the colleague sent an e-mail to the friend stating that the food was great. By itself, this message appeared very sincere. The only way to know the message’s intended sarcasm would be to have access to the privileged information of the bad dining experience. Participants who had this privileged information were then asked how they thought the colleague’s friend would perceive the message. High-power participants were found to be more likely to assume that the colleague’s friend would perceive the sarcasm in the message. This confirmed the hypothesis that as power increases, power-holders are more likely to assume that others’ insights match their own. The investigators also discovered that power can inhibit empathy, the ability to perceive another person’s emotional states. After being primed with power, participants were shown a set of twenty-four images of faces expressing either happiness, sadness, fear, or anger. For each image, the participants were asked to guess which of these four emotions was being expressed. High-power participants made more errors in judging the emotional expressions of others than were baseline participants who had not been primed. It may be that reduced perspective-taking is not a conscious decision that happens when power is attained; rather, it might be a psychological state that is an emergent property of increased power. Furthermore, reduced perspective-taking might be a way to prioritize one’s attention toward the most important tasks among a multitude of responsibilities that often accompany increased power. If reduced perspective-taking is indeed an automatic effect, then there is all the more reason for concerted measures to eliminate it. One of the best means to inspire perspective-taking in the powerful is to make leaders feel more responsible for their subordinates. Closely related to this is the need to make leaders accountable, to keep their more egocentric and destructive psychological forces in check. Galinsky offers the metaphor of driving a car to understand how power can be transformed into effective leadership. The agency of power is akin to pressing the gas pedal. Without acceleration, one is left standing still, unable to move forward. But one also needs a steering wheel to avoid crashing into obstacles along the way. Perspective-taking without agency is ineffective, and agency without perspective-taking is dangerous and irresponsible. Effective leaders require acceleration and prudent steering—power coupled with perspective-taking. The springboard of power combined with perspective-taking may be a particularly constructive force to develop socially responsible global leaders.